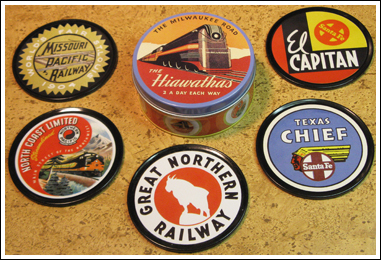 Your guests will think that you stayed at a fabulous hotel or traveled a storied railway line when they use these great coasters, but we won’t tell. 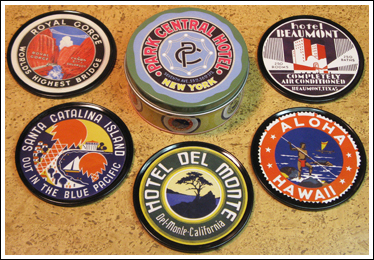 Reproduced from period luggage labels and travel stickers, these metal coasters retain their vivid colors and feature raised edges (to keep the glass in place) and a cushioning cork back (to protect your furniture). Each set of 6 different coasters (3-1/2" diameter) comes in a coordinating keepsake tin.